So these two cards, again, articulate quite clearly a rather relevant message for me. 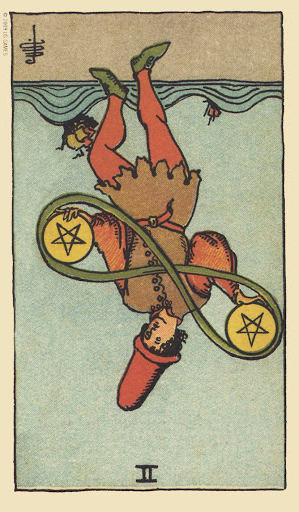 The reversed two of pentacles - the juggler, trying to keep the two balls in the air, trying to keep up with so many things. Too many things - a rather common problem for me, on all kinds of levels. I almost lost my phone last night (luckily, some friends found and held onto it for me), and due to the massive amount of things I carry around in my bag every day - laptop, several notebooks, e-reader, physical book, tarot deck, pens, highlighters, beverage - I couldn't even be sure it was gone until I got home, couldn't figure out where I'd lost it. I always carry around too many things. Coming here I had to pay a not insignificant fee for having too-heavy checked luggage. A good number of the things, clothes, that I brought I haven't even needed. And of course, every time I go somewhere, travel or move, I TRY to pack light, and every time I still end up with too much because I simply cannot let go of things, put them aside, leave them behind. In academics too, the same. I finally got to finalizing my class schedule for the fall, and once again I seem to be setting myself up for a semester that will be...very intense. Do-able, but just barely, and only with far too much stress and not enough sleep, same old less than healthy routine. Why? 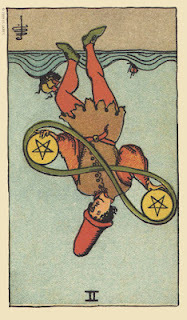 The compulsive need to try to juggle as much as I possibly can. The inability to let go, leave behind, put aside. 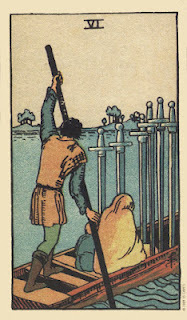 It's funny, me in relation to that six of swords. It's a card both of moving forward, exploration of new things, learning from trying the new, and of letting go, leaving behind, escape. I am great at the former and very lacking in the latter. I do move forward, both physically in traveling and moving to different cities, apartments, places, and more mentally; and yet, each time, I try to keep everything from behind with me, even the things I no longer need. I have metro/train passes from four different cities in my wallet, still. I have money from three different countries in my purse. Why? Cancerian nature, perhaps, clinging. Totally sympathise. The juggling of the 2 Pents can be a killer - I too tend to take on more than I really ought to handle (maybe we like higher stress levels!) and ALWAYS manage to do it, but STRESSED TO HELL.